Disturbing video has emerged of a priest slapping a baby across the face as he administers a baptism. 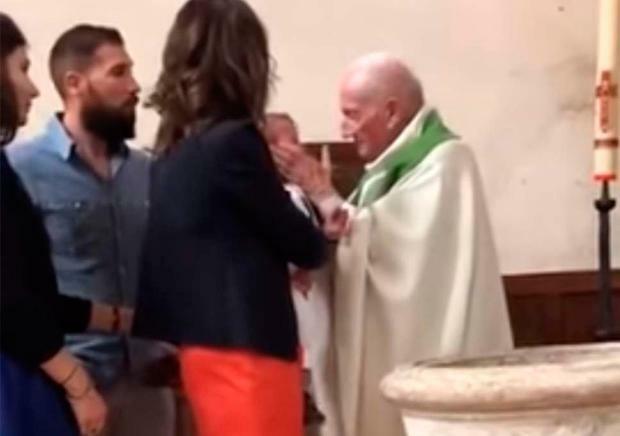 In a 40-second clip posted online, the French-speaking clergyman is seen to slap the baby during the ceremony as the tiny child is held by a woman thought to be his mother. The exact location of the church and date of the incident are unclear, although the video surfaced on the internet on Wednesday. “I'm going to put water on the forehead, and after I'll embrace the little man, because he will have become a little Christian,” the elderly priest says in the footage. He then gives a sharp slap against the baby’s cheek, shocking those sat in the church, who can be heard to gasp. Having seen enough, a man thought to be the child’s father steps in and tries to remove him from the situation – only for the priest to grip the boy. Those gathered in the church can be heard to tell the cleric: “Don’t hit the kid,” and: “Sir, we do not hit him,” but he is seemingly unapologetic. “You have to calm down, you have to calm down. There you go,” the priest tells the child as the parents of the infant appear increasingly agitated. The mother pleads with the priest to let go, but he continues to grip the boy by the head. The father is then able to wrestle the baby away and into his arms, as another woman attending the service also intervenes in a bid to calm the tensions when the video cuts out.